The model has been described as 'the most detailed model of the virus to date'. A student at the Glasgow School of Art (GSA) has created a highly-detailed 3D model of the influenza virus, helping experts to learn more about the bug. The GSA said the first detailed model of the virus was recently created by a team of scientific illustrators in Russia. Student Naina Nair, a 32-year old dentist from Bombay who is studying medical visualisation at the art school, is said to have incorporated even more data into her model. Her work has been unveiled at the opening of the GSA's 2017 graduate degree show. Dr Ed Hutchinson, a research fellow in the MRC-University of Glasgow Centre for Virus Research, worked with Ms Nair on the project. He said: "Naina has done an impressive job of incorporating data from a variety of cutting-edge experimental approaches to produce something that clarifies our thinking about influenza viruses. "Her 3D model is allowing us to understand the structure of the flu virus at near-atomic resolution and has clarified a number of outstanding questions, including the extent to which an influenza virus can incorporate proteins from our own bodies into its virus particles. "The model is also going to be invaluable to us in sharing information about the flu virus, especially when talking to non-expert audiences." 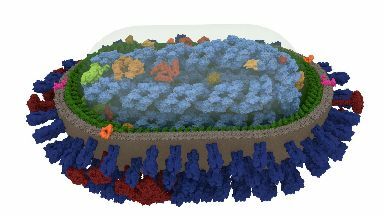 The GSA described the model as "probably the most detailed 3D model of the influenza virus to date". Ms Nair said: "The influenza virus is a deceptive, dangerous pathogen and I am delighted that by developing viral models with the new data I have been able to help the research community with their on-going study of these infectious deadly viruses." GSA director Professor Tom Inns said: "Naina's astonishing visualisations of the flu virus are just one example of how our students and researchers, in collaboration with experts across a variety of fields, can help solve issues that have an enormous impact on people's day to day lives by visualising extremely complex information."